Mlup Baitong works closely with communities in order to support them to improve their livelihoods. People in remote villages often lack basic infrastructure, access to information, and skills to improve their own situation. The short project descriptions below give you an overview on how we enable communities to improve their livelihoods and to increase their resilience to the effects of climate change. This project is part of a larger We Effect’s Program in Cambodia, Vietnam, and Myanmar mainly oriented towards the Strengthening of Capacities for Sustainable Development of Rural Co-operatives as well as other farmer organizations, and particularly women. The overall objective of this project is that “Smallholder farmers and agricultural producers in poverty, especially women and ethnics, are economically empowered and socially included to reach equitable growth and equal rights”. The target group for this project is composed of 823 small-scale farming households consisting of 1,507 direct beneficiaries (823 women) and 13,694 indirect beneficiaries (6,764 women) and their Community Based Organizations (CBOs). Other stakeholders include local government authorities in charge of forest management, agriculture, commerce/business, women’s affairs, and law enforcement, private sector actors and other NGOs. Limestone karsts have been shown to be biodiversity “arks” which contain very high levels of biodiversity and endemism, yet these landscapes are understudied and largely unprotected, particularly in Southeast Asia. Among the unique and diverse floras of tropical Asia, Cambodia’s flora ranks as one of the least known yet most intact. Cambodia harbors a significant number of karst formations with endemic plant communities on limestone substrates (karst) that were never explored by French botanists, much less described systematically. 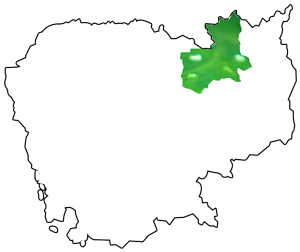 Karst caves, however, are well known for extremely high endemism and biodiversity of bats, fish, and invertebrates. Yet while karst makes up around 10% of the land area in Southeast Asia (including China), it only accounts for about 1% of biodiversity research. To research and protect this invaluable landscape, IUCN has initiated a project in Kampot province. At the heart of the project is the establishment of a protected area (PA) covering a cluster of five karst hills in Kampot Province: Phnom Kampong Trach, Phnom Damrey, Phnom La’Ang, Phnom Chhgnauk, and Phnom Kbal Romeas. 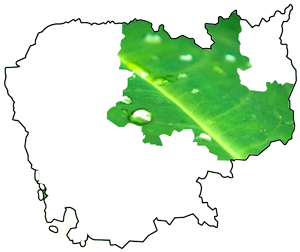 A conservation corridor will connect Phnom Kampong Trach and Phnom Damrey. These sites were chosen because they are all relatively intact and have significant bat populations, cultural heritage sites, or other forms of on-going eco-tourism (e.g. rock climbing, caving). Phnom La’Ang is the largest intact karst formation in Kampot and likely to harbor some of the highest levels of biodiversity amongst the Cambodian karst. Develop and distribute advertising materials to promote appropriate community-based eco-tourism activities at the newly established PA site. In 2016, Winrock International was looking for a partner to design and deliver a training programme to support government officials and communities to develop awareness, skills and knowledge to adapt to the effects of climate change. This training is embedded in a larger project called USAID Supporting Forests and Biodiversity (USAID SFB) implemented by Winrock International. It focuses on climate change mitigation through conservation in the Prey Lang and Easter Plains landscapes. Mlup Baitong identified three underlying problems to be addressed by the trainings: effects of climate change, lack of secure livelihoods, and limited knowledge and capacity regarding climate change resilience. Droughts, floods, and unpredictable weather patterns pose a serious risk of crop failure, as well as animal diseases. Additionally, traditional cultivation methods and crops are often not well suited to cope with the effects of climate change, leaving forest- and agriculture-dependent communities struggling for their livelihoods. While the effects of climate change have seriously impacted people’s lives, especially the poor, their understanding of phenomena, causes, and effects of climate change is very limited, and their capacities to mitigate adapt to climate change are very weak. 1. Awareness raising on ways to adapt to climate change: Capacity building on causes, effects, and adaptation to climate change. 2. Demonstration of livelihood options for agriculture and non-timber forest products to adapt to climate change: Practical training on adaptive cultivation technologies and alternative livelihoods e.g. from NTFP and micro-businesses. 3. Joint identification of a set of collective climate change adaptation actions for each community: For example collective infrastructure, pooling of resources, and collective business ideas such as eco-tourism services – tailored to each community’s situation. After the completion of the training modules, communities and government officials understand causes and effects of climate change, and are able to actively take first steps towards adaptation and mitigation for securing their future livelihoods. 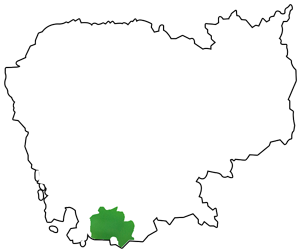 Borey Osvay and Preah Rumkel communes are bordering the Mekong in Cambodia’s Northeastern province of Stung Treng, close to the border with Laos. The river here is broad and wild, intersected with small islands, and its waters create a cascading waterfall. The waters are also one of the few remaining homes of the endangered and rare Irrawaddy dolphin. 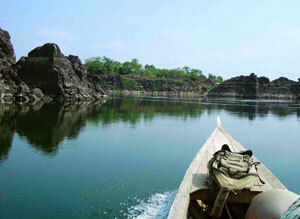 For all its spectacular nature, the area is a hidden gem for tourists who travel off the beaten track. Protection of these beautiful and remote landscapes is important to both the people who live here and to the biodiversity and wildlife of the Mekong region. Our project thus focused on two interlinking ideas: To conserve the environment and to improve the livelihoods of the communities. Community based ecotourism is the ideal way to achieve these goals in this area which is so rich in nature. The project’s objectives were to promote environmental conservation and community-based ecotourism (CBET) initiatives and to build capacities of community members, particularly women, to enable them to manage the CBET self-sufficiently and sustainably. 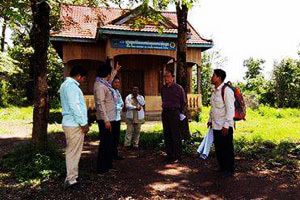 Some basic CBET management structures and infrastructure already existed in Preah Rumkel and Borey Osvay, and the project built on these during the implementation. 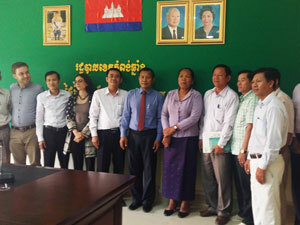 In cooperation with Cambodia’s Ministry of Tourism, Mlup Baitong reviewed and improved existing management systems of the CBET, rebuilt capacities of the management committee members and tourism providers, established and renewed tourism facilities, promoted the site through advertisement and marketing mechanisms, and improved mechanisms for the protection of natural resources, focusing on forests and dolphins. The project’s objective is to enable the target communes to develop their capacity and adopt mechanisms for sustainable community livelihood improvement and environment management. It is part of a larger We Effect program to empower small-scale farmers in remote areas in Vietnam, Myanmar, and Cambodia, focusing also on strengthening capacities of civil society organizations. The program particularly supports small-scale farmer organizations to address the needs and rights of their members and constituents. In Cambodia, Mlup Baitong has chosen two poor communities in the Northern province of Stung Treng to benefit from the project. 95% of people here depend on agriculture for their living and almost half of the target households lived below the poverty line of 1 USD per day before joining the project. In order to improve the communities’ livelihoods in a sustainable manner, Mlup Baitong enables them to develop capacities and to apply mechanisms for sustainable livelihood improvement. Village members are organized in farmer cooperatives and receive training in management, self-help group (SHG) development, and marketing. In the self-help groups, the members mobilize monetary resources which they use to start small businesses, such as pig raising, chicken raising, and pig feed production. They also receive training on new farming technologies and practices to improve yields and promote the sustainable use of natural resources. The logging of luxury-grade timber in order to yield high prices from national and international buyers threatens Cambodia’s forests. Mlup Baitong’s project to establish community forests aimed to protect forests against illegal logging and to supply villagers with additional incomes which are not based on exploiting the forest. In order to legally establish community forests with management plans, Mlup Baitong supported the communities to work closely with the commune council and the Forestry Administration. Activities ranged from conducting forestry inventories, to establishing boundary poles and patrolling the sites. In the process, the villagers also learned about their forests and their protection, and developed their own business ideas. 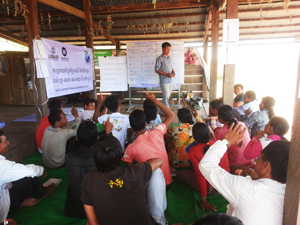 The community members received training to strengthen their capacities in e.g. value chain analysis and marketing (access to markets, product prices, target groups etc.) in order to facilitate the establishment of small businesses. These small businesses contribute to the target households’ income and improve their livelihoods. Revolving funds groups set up by the project enable members to collect financial resources which they can use to develop their businesses and to actively manage and protect their forests. In 2016, GERES was looking for a partner to engage and build capacity of district and commune councils as well as local citizen in the development of a climate change resilience strategy. The CEMAATERR program aims at increasing the resilience of rural regions and secondary relay cities to climate change through institutional support and adaptation and mitigation measures, thus reinforcing the social and economic resilience of current and future generations. 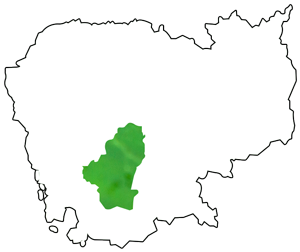 This program is mainly funded by Agence Française de Développment (AFD). Identification, selection and engagement of the public authorities, districts and communes to be supported by the program. Capacity building of the district and commune councils on the integration of climate change issues into territorial planning, local development documents and policies. Engage the district and commune councils as well as the local citizens in the definition and development of climate resilient territorial planning. 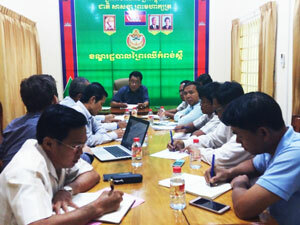 After the completion of the training modules, district and commune councils, as well as local citizens, are expected to understand causes and effects of climate change, and be able to actively take first steps towards adaptation and mitigation, and integration into the Community Development Plans (CDP). In recent years, Cambodia has experienced more and more severe droughts and floods as a result of a changing climate. The kingdom is especially vulnerable to climate change, as large parts of the population rely on climate-sensitive sectors including agriculture, forestry and fisheries. Being a developing country with limited infrastructure and ability to adapt to the changes, climate change can have severe negative impacts, especially for rural communities. 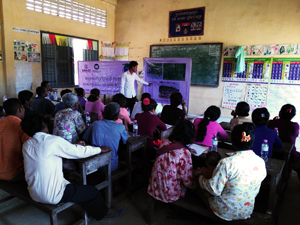 This project contributed to poverty reduction and equity among vulnerable groups in Cambodia. Mlup Baitong supported poor remote communities to build resilience against climate change in order to secure their livelihoods. Farmers received training and support on how to adapt their traditional farming systems to climate change in order to reduce their vulnerability, increase food security and improve livelihoods. Mlup Baitong taught farmers about farming techniques which enable higher harvest yields and are less vulnerable to a changing climate. 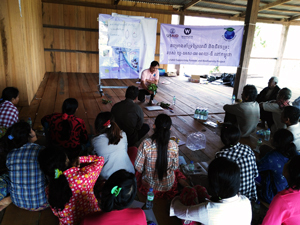 In Farmer Field Schools, they received training about system of rice intensification (SRI) and integrated farming systems (IFS). SRI training focuses e.g. on seed selection, preparation of land, rice planting, usage of drum seeders and soil fertilizer, weed and insect control, and rice harvesting. IFS teaches methods to diversify the range of farmed crops and to include livestock in order to mitigate risks connected to rice farming and to provide families with additional nutrient food. The farmers learned e.g. how to grow long beans and cucumbers, and how to raise fish and chickens. In order to multiply the effects of these trainings, Mlup Baitong organized study and exchange visits to motivate farmers to use the new techniques and to spread knowledge and experiences among communities. Just like the ELRCC project, this project focused on strengthening farmers to cope with the effects of climate change in a sustainable way. 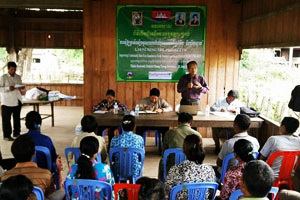 The project provided a series of trainings on cause and impacts of climate change, new agricultural techniques and management, to around 500 participants. 20 Farmer Field Schools (FFSs) were set up, and they practiced different kinds of drought resilient farming activities including system of rice intensification (SRI), crop diversification, and integrated farming systems (IFS). 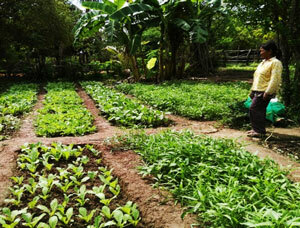 Additionally, farmers erected compost pits and learned how to produce and use organic compost. In order to ensure the success of the agricultural activities in times of drought and water shortage, the project constructed small scale irrigation systems such as ponds and wells. The farmers involved in these pilot activities and other community members gained positive impacts on their livelihoods, so that over 100 other farmers replicated the new agricultural techniques. In order to reach out to a larger part of Cambodia’s population, Mlup Baitong created a series of radio programs and live talk shows about impacts of climate change on agriculture in Cambodia, other impacts of climate change, general community knowledge about climate change, and the relation between gender and climate change. Being broadcasted more than 150 times in 19 different provinces, the radio shows reached around 9.5 million listeners.